Here is the wedding highlight video that we made for Rebecca & Bryan.For us here at SDE Weddings®, Toronto’s premier wedding videography, cinematography, and photo booth rental company, nothing fills our hearts with joy more for our videographers and cinematographers than having played a crucial part in documenting and producing an eternal memento of a perfect couple’s perfect wedding day. Witnessing the blossoming of a couple’s true love on their wedding day, and a welcoming of a new life together in marriage, is one of the most beautiful events one can witness in life. And our videographers and cinematographers know very well just how precious these moments are. So for our team, the story of Rebecca & Bryan is a truly heartfelt and emotional one. A lovely couple from Toronto, Rebecca & Bryan had chosen to hold their wonderful wedding day ceremony and celebration earlier this summer on July 7th, 2018 at the beautiful and elegant Royal Ambassador Banquet in Caledon, just northwest of our familiar hometown of Toronto. Holding a perfect outdoor ceremony under a pristine and spotless summer sky and surrounded by the gorgeous greenery of Ontario’s vast and expansive countryside, Rebecca & Bryan held a truly unforgettable wedding day ceremony and celebration and gave our wedding videographers and cinematographers plenty of wonderful footage to work with for their custom-made wedding day film. 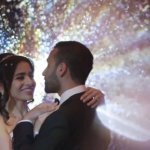 A true celebration of love, and a hallmark of two lives finally brought together and made as one; Rebecca & Bryan shared with our videographers, photo booth staff, and cinematographers the happiest moments of their lives. Rebecca & Bryan’s wedding was exquisitely planned by Kayla from Bridal Solutions, who we had the fortune of working with on her very own wedding day at the Royal Ambassador. Kayla’s husband, Joe, is the sales manager for the DJ services company Digital X, which was the DJ company used by Rebecca & Bryan. And with that, we share with you some of our favourite scenes and memories made during Rebecca & Bryan’s wondrous wedding day. So join us as we recall the many perfect scenes captured by our team during Rebecca & Bryan’s summer season wedding day, and join in on our trip up north to one of our favourite and most memorable summer weddings, and indeed one of our best this year.